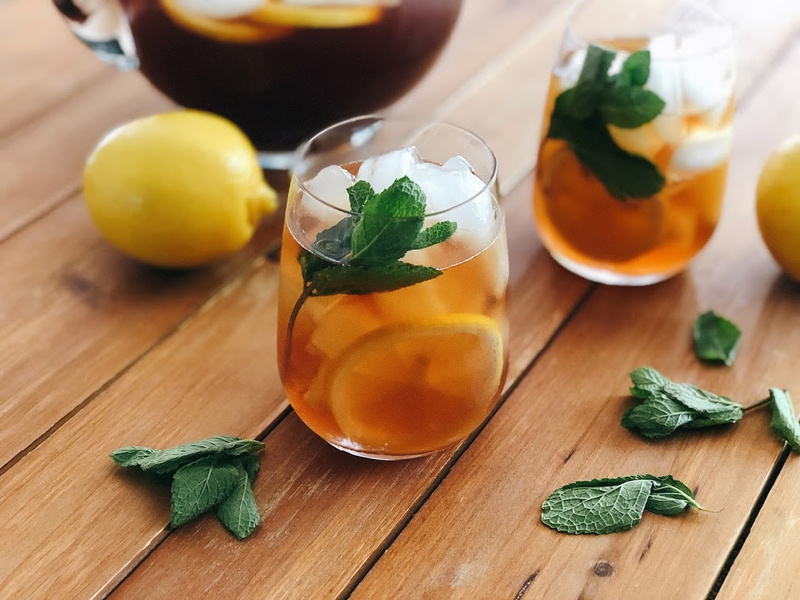 This Mojito Iced Sweet Tea recipe is a sponsored conversation written by me on behalf of Tetley® Tea. The opinions and text are all mine. 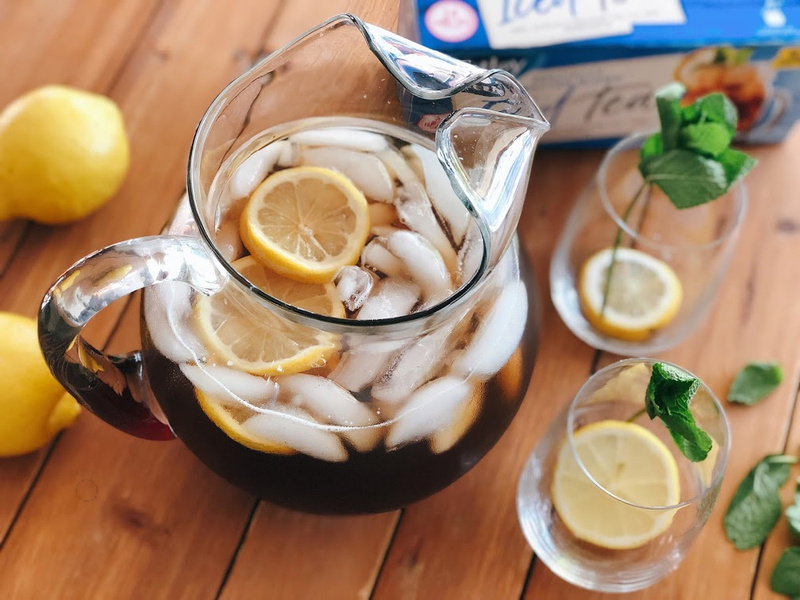 Getting sweet on Tea with Publix New Southern Special Teas with Tetley® Tea. Southern-style sweet tea is my guilty pleasure. 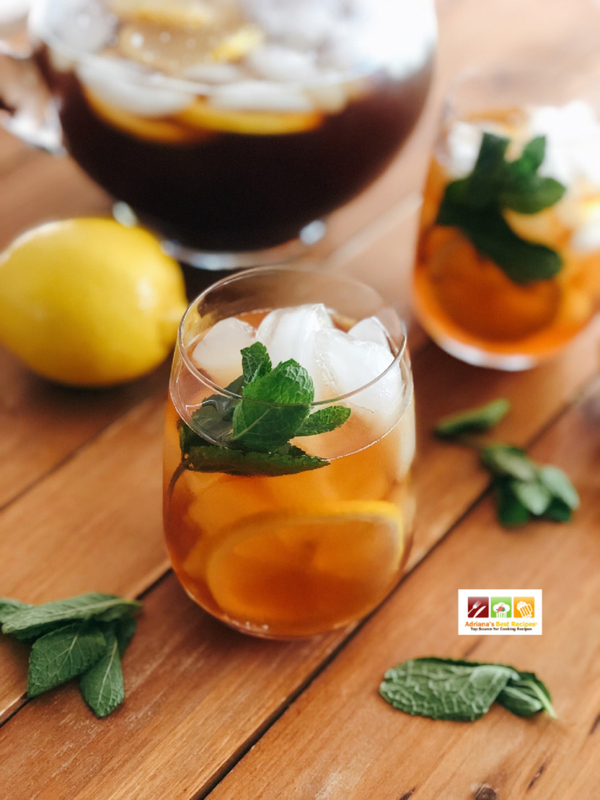 I prepare it at home using different flavors, and today I have created a Mojito Iced Sweet Tea recipe using Tetley Iced Tea, sugar cane, homemade mint extract, and yellow lemon slices. Last year I had the chance to try real deal Southern cuisine favorites at two famous restaurants, one located in Atlanta and the other in Savannah. 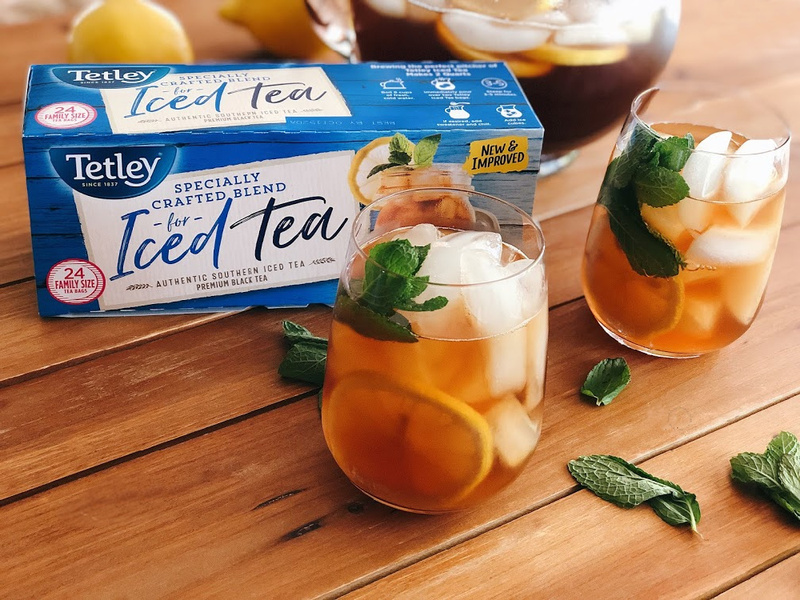 The iced tea offered at those eateries is one of my favorites as it has hints of mint, and I have tried to replicate the authentic Southern flavors of their sweet tea but haven’t been successful until I tried Tetley Iced Tea. The NEW and improved Tetley Iced Tea is a specially crafted iced tea blend with 12% Nilgiri Tea to help enhance the tea’s crispness and sweetness, which helps hold flavor. Nilgiris, or The Blue Mountains, are a range of hills in Southern India that are home to some of the highest grown teas in the world, which results in a unique combination of fragrance and crispness, making some of the best iced teas. 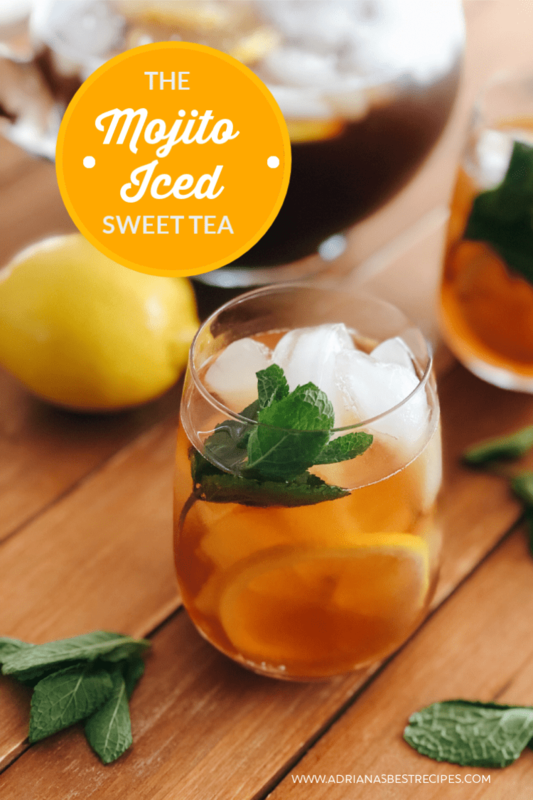 If you are an iced tea lover like me, you will love my version of a mojito iced sweet tea. It is perfect to pair with any meal and to enjoy alone as a midday refreshment. You can bring a bottle of Tetley Tea with you while you’re on the go too. 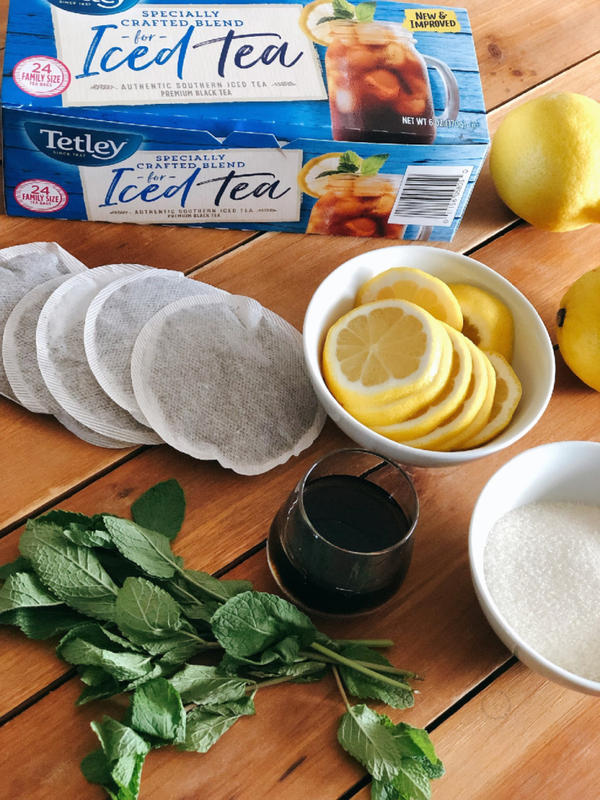 Craft your pairings using your favorite juices and herbs, or you can add Tetley Iced Tea to homemade lemonade also; you will be surprised how good it tastes! I purchased the Tetley Black Iced Tea 24ct and all the ingredients needed for the mojito iced sweet tea recipe at Publix. I invite you to shop there and grab the special offer! 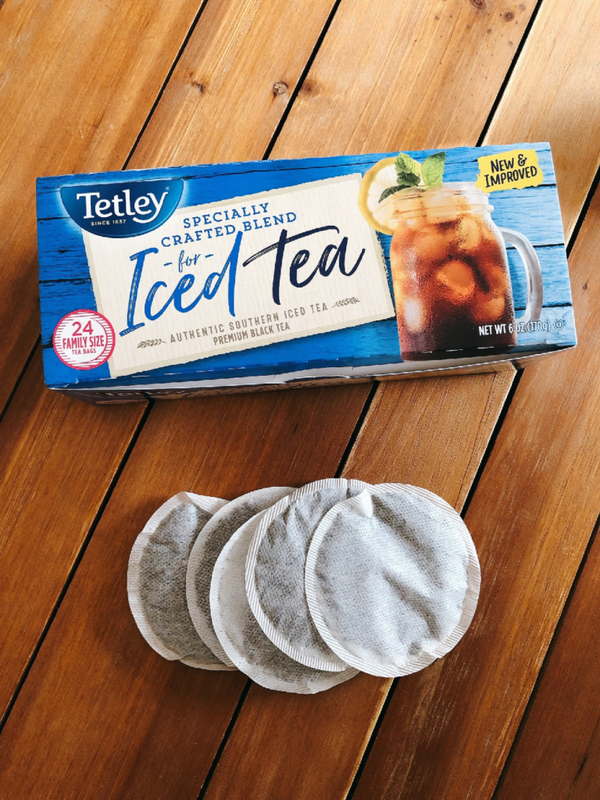 Buy Tetley® Iced Tea 24 ct. for only $1.50 at Publix® from 1/23/19-1/29-19. At Tetley Tea they are committed to ensuring a better life for their farmers, better tea for us and a better environment for everyone. Learn more at www.tetleyusa.com. Herb extracts and how to use them to flavor iced sweet tea. Herb extracts are simple to make and can have a long shelf life when stored or kept in refrigeration. 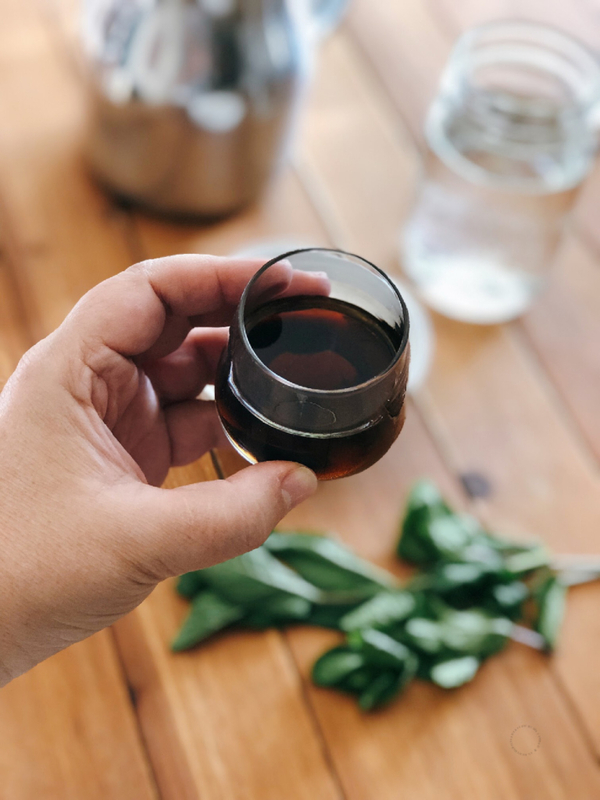 Using extracts adds flavor to beverages and teas without adding sugar. One bunch of fresh mint and a cup of boiling water. Add the mint sprigs to a mason jar, pour the boiling water, cover with the cap and let it rest until reaching room temperature. Refrigerate and remove the mint sprigs when the extract acquires a deep green-brown color. Keep in refrigeration until ready to use. You can use almost any herb, like basil, lavender, and thyme. All of these herb concentrate preparations pair well with lemonades and sweet iced tea. Start making your favorite combinations and prepare a pitcher of sweet iced tea for with friends and family. Prepare the Mojito Iced Sweet Tea Today! There are many variations and different recipes for sweet tea, but the essential steps remain the same. Sugar is added to the mixture while it is still hot; this is what makes it real sweet tea. Then you pour the tea base into a pitcher with ice. 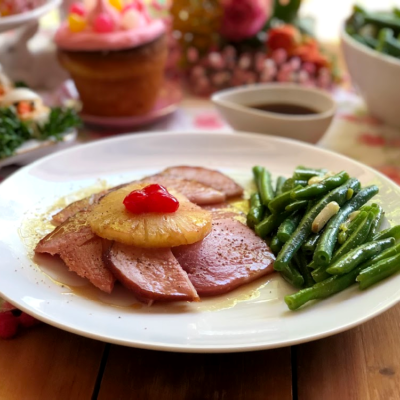 Follow the recipe details below; this recipe is ready in just a few minutes. Make Mojito Iced Sweet Tea using Tetley® Tea, sugar cane, homemade mint extract, and yellow lemon slices. A refreshing drink that you will love. Buy Tetley Black Iced Tea 24ct at Publix. Boil 8 cups of water on the stove, or if using a gooseneck electric kettle heat the water at a temperature of 212 degrees Fahrenheit. Add two bags of Tetley Iced Tea to a tea pitcher and pour in the boiling water. Let the tea steep for 3-5 minutes. Sweeten the tea with sugar cane or a sugar-free sweetener of your choice. Add the homemade mint extract to the tea and mix. Pour the tea to another pitcher with ice, add yellow lemon slices, and fresh mint. Serve cold and enjoy with your meals, as a refreshing pick me up, or on the go. Replace sugar cane with a sugar-free substitute. Add the sugar when the tea is still hot. Make sure boiling water has a temperature of minimum, 212 degrees Fahrenheit for achieving best flavor. Tetley Iced Tea offers an authentic Southern style iced tea experience. It is not bitter, never clouds, it is naturally sweet, and is made with premium black tea. I love a cup of tea but never had it iced. With mint and lemon, it sounds really refreshing for hot days. This sounds delicious – I will look forward to trying over the weekend 🙂 I love how clever this idea is! How refreshing do these look! They would be perfect for a summer garden party. 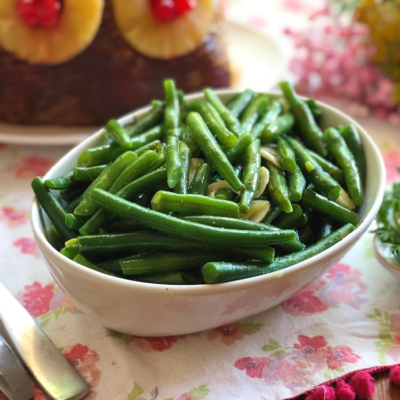 What a fun and fresh recipe! This would be a great idea for a get together or party!!! You bet perfect for upcoming BIG game day too! 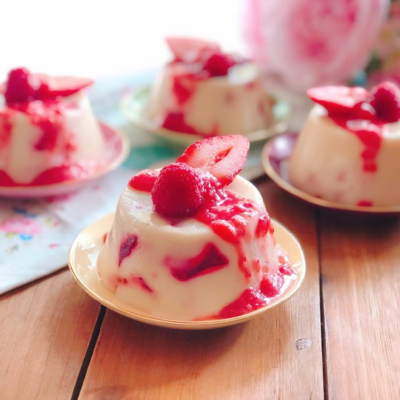 You bet very easy to make and so good! I agree with you mint is a great addition to sweet iced tea. Thanks for stopping by! This is such a fun and unique idea. It would be the perfect summer drink – the flavors are so yummy! I love iced tea and I love mojitos so this looks like the perfect thing for me! 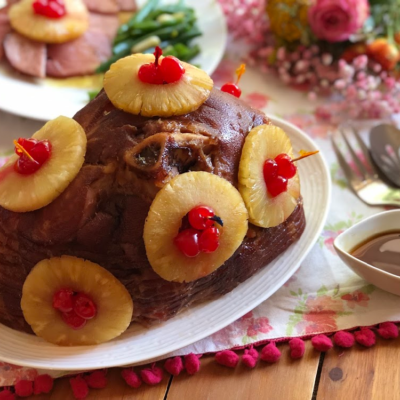 I am so glad you enjoyed this recipe it is so good! Wow! This looks so delicious. Perfect drink using my two favorite things: iced tea and mojitos! What a great idea. Couldn’t agree more this is a good option for entertaining too. I need to make me this tomorrow, and I will definitely enjoy it since its the weekend. It looks so delicious. Thanks for considering our recipe if you make it please come back and tell us how you liked it. So refreshing! Spring is just around the corner, right?! I live in Florida and drinking iced tea is an everyday occurrence. It is a perfect drink for pairing the meals. Wow, this is such a great idea! Such a delicious and refreshing drink! This sounds so refreshing. Wish I had this with my dinner tonight. But can make it this weekend now I have the recipe. My family will love this. This sounds like a delicious summertime drink! My husband loves Mojitos and Iced Tea so he would LOVE this! Now this sounds like a delicious iced tea. I have to admit I am a tea of all kinds fan and I 100% need to give this a try I can imagine it being very refreshing. I definitely need to try this. I’m sending my hubby to the store to get all of the ingredients. Oh wow, this looks really refreshing! I am a huge fan of iced tea, and this seems to be an amazing midday refreshment indeed. I definitely have to try this recipe! By the way, you’ve captured such great photos! Of late, I’m getting into drinking healthy teas so for sure, I’m all for this sweet iced tea. I’m certain the mint flavor makes it even yummier! 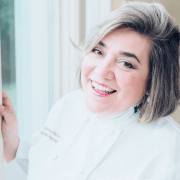 I am an avid tea drinker and this recipe for tea sounds like just what the flavor doctor ordered for any day of the week. Plus any time I can add mint to something I’m game! I was searching for a refreshing drink and this is perfect. Will try to make this later. 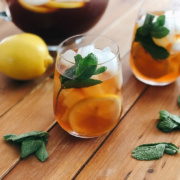 That is perfect iced tea, I will try this recipe once the weather get warms up. Now it is cold, I like warm tea. We drink this tea on cold and warm weather as it pairs well with all meals. This looks like such a delicious drink. Definitely, something I would be interested in trying. Love a great tea with a bit of mint. I want to try this one. We are having a movie marathon tonight and I wanna drink this while watching. It’s summer in my city right now and this looks like the perfect drink to refresh on a hot day! This sounds like a refreshing and cooling tea for summer. I am bookmarking this for future. Thanks you so much.